"Mercy, no! " exclaimed Juliet. "That's for Gabrielle Melville. It would never do for you two to miss each other to-night. I put them down for her, as she's to play later in the evening on the violin, you know, and I knew she'd never get here in time to do it herself. She always has such frantic times dressing. Just struggles into her things, never can find half her clothes, and what she does manage to fall into catches and rips in the struggle. Her hat is always over one ear, and her belts never make connection in the back, but she's so adorable that nobody minds her wild toilets. They laugh and say, 'Oh, it's just Gay.' That's her nickname, you know. Here's Emily Chapman coming to claim, you. Emily, you can tell Lloyd some things about Gay, can't you?" "I rather think so," laughed Emily. "We roomed together last year, and I got her again this term. It took a fight, though, for she's the most popular girl in school." "Is she pretty?" asked Lloyd. "We think so, don't we, Juliet? If she had any enemies, they might say that she has red hair and a pug nose. But that would be exaggerating. Her hair is that beautiful bronzy auburn that crinkles around her face and blows in her eyes till she always seems to be bringing a breeze with her." "And her nose isn't pug exactly," chimed in Juliet. "There's just a darling, saucy little tip to it, that seems to suit her. She wouldn't be half as pretty with the approved Gibson girl kind, no matter how perfect it was." "And her complexion is so lovely," Emily resumed, enthusiastically. "And her eyes are a jolly, laughing kind of brown, with an amber sparkle in them, except when she gets into one of her intense, serious moods. Then they are almost black, they're so deep and velvety. She's never twice in the same mood. Oh! There she comes now." 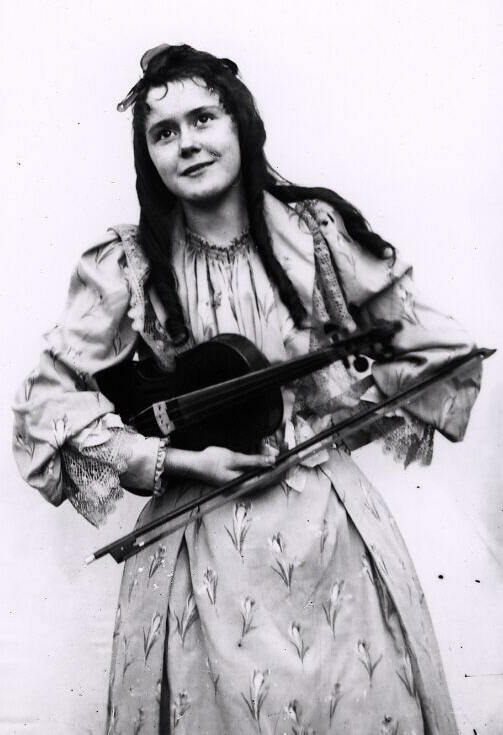 A side door opened, and a slim little thing all in white, with a violin under her arm and a distracted pucker on her face, hurried up to the piano. Nervously feeling her belt to make sure that she was presentable before turning her back on the audience, she whispered to the girl who was to play her accompaniments, and began tuning the violin. Then, tucking it under her chin as if she loved it, she listened an instant to the piano prelude, and drew her bow softly across the strings. "Good!" whispered Emily. "It's that Mexican swallow song. She always has such a rapt expression on her face when she plays that. She makes me think of St. Cecilia. She's so earnest in all she does. If it's no more than making fudge, she throws her whole soul into it, just that way. She's as intense as if the fate of a nation depended on whatever she happens to be doing." … "Doesn't Gay play splendidly?" she exclaimed, not knowing that she had been the previous topic of conversation. "We think she's a genius. She improvises little things sometimes in the twilight that are so sweet and sad they make you cry. Then she's unconventional enough to be a genius. She's always shocking people without meaning to, and so careless, she'd lose her head if nature hadn't attended to the fastenings. "We all love her dearly, but we vowed the last time we went sightseeing that she should never go with us again unless she let us tie her up in a bag, so that nothing could drop out by the way. First she lost her hat. It blew off the trolley-car, one of those 'seeing Washington' affairs, you know. She had to go bareheaded all the rest of the way. Then she lost her pocketbook, and such a time as we had hunting that. The time before, she lost a locket that had been a family heirloom, and we missed our train and got caught in a shower looking for it." "Where does she live?" asked Lloyd, watching the bright face that was making its way toward them across the crowded room. "At Fort Sam Houston, down in San Antonio. Her father is an army officer at that post." There was no time for further discussion, for Gabrielle was coming toward her with outstretched hand. "This is Juliet's Princess, isn't it?" she asked, with a smile that captivated Lloyd at once, flashing over the whitest of little teeth. "You're getting all sorts of titles to-night. I heard a girl speak of you as a mermaid in that pale sea-green gown and corals, but I've come over here on purpose to call you the 'Little Colonel.' You don't know how much good it does me to hear a military title once more. Out at the fort it's all majors and captains and such things." Then, dropping her grown-up society manner, she suddenly giggled, turning to include Emily in the conversation. "Oh, girls, I had the worst time getting dressed this evening that I ever had in my life. When I unpacked my trunk yesterday, everything was so wrinkled that there was only one dress I could wear without having it pressed; this white one. So I laid it out, but, when I went to put it on to-night, I found that mamma had made a mistake in packing, and put in Lucy's skirt instead. Lucy is my older sister," she explained to Lloyd. "We each had a dotted Swiss this summer, made exactly alike, but Lucy is so much taller than I that her skirts trail on me. Just look how imposing!" She swept across the floor and back to show the effect of her trail. "Of course there was nothing to do at that late hour but pin it up in front and go ahead. I'm afraid every minute that I'll trip and fall all over myself, but I do feel so dignified when I feel my train sweeping along behind me. The pins keep falling out all around the belt, and I can't help stepping on the hem in front. I love trains," she added, switching hers forward with a grand air that was so childlike in its enjoyment that Lloyd felt impelled to hug her. "It gives you such a dressed-up, peacocky feeling." Then she looked up in her most soulful, intense way, as if she were asking for important information. "Do you know whether it's true or not? Does a peacock stop strutting if it happens to see its feet? My old nurse told me that, and said that it shows that pride always goes before a fall. I never was where they kept peacocks before I came to Warwick Hall, and I've spent hours watching Madam's to see if it is true. But they are always so busy strutting, I've never been able to catch them looking at their feet." She glanced at her own feet as she spoke, then gasped and, covering her face with her hands, sank limply into a chair in the corner behind her. "What's the matter?" cried Juliet, alarmed by the sudden change. "Look! Oh, just look!" was the hysterical answer, as she thrust out both feet, and sat pointing at them tragically, with fingers and thumbs of both hands outspread. "No wonder they felt queer. I was so intent on getting my dress pinned up, and in rushing out in time to play, that I couldn't take time to analyze my feelings and discover the cause of the queerness. Madeline blew in at a critical point to borrow a pin, and that threw me off, I suppose." From under the white skirt protruded two feet as unlike as could well be imagined. One was cased in dainty white kid, the other in an old red felt bedroom slipper, edged with black fur. "And it would have been all the same," sighed Gay, "if I had been going to an inaugural ball to hobnob with crowned heads. And I had hoped to make such a fine impression on the Little Colonel," she added, in a plaintive tone, with a childlike lifting of the face that Lloyd thought most charming. If the mistake had been made by any other girl in the school, it would not have seemed half so ridiculous, but whatever Gay did was irresistibly funny. A laughing crowd gathered around her, as she sat with the red slipper and the white one stretched stiffly out in front of her, bewailing her fate. "Anyhow," she remarked, "I'll always have the satisfaction of knowing that I put my best foot foremost, and if they had been alike I couldn't have done that. Now could I?" And the girls laughed again, because it was Gay who said it in her own inimitable way, and because the old felt slipper looked so ridiculous thrust out from under the dainty white gown. As others came crowding up to see what was causing so much merriment in that particular corner, Gay attempted to slip out and go to her room to correct her mistake. But Sybil Green, pushing through the outer ring, came up with Allison and Kitty. "Gay," she began, "here are the girls that you especially wanted to meet: General Walton's daughters." Gay's face flushed with pleasure, and, forgetting her errand, she impulsively stretched out a hand to each, and held them while she talked. "Oh, I'm so glad to meet you!" she cried. "I wish that I had known that you girls were here yesterday before papa left. He is Major Melville, and he was such a friend of your father's. He was on that long Indian campaign with him in Arizona, and I've heard him talk of him by the hour. And last week" --- here she lowered her voice so that only Allison and Kitty heard, and were thrilled by the sweet seriousness of it. "Last week he took me out to Arlington to carry a great wreath of laurel. When he'd laid it on the grave, he stood there with bared head, looking all around, and I heard him say, in a whisper, ` No one in all Arlington has won his laurels more bravely than you, my captain.' You see it was as a captain that papa knew him best. He would have been so pleased to have seen you girls." Kitty squeezed the hand that still held hers and answered, warmly: "Oh, you dear, I hope we'll be as good friends as our fathers were!" And Allison answered, winking back the tears that had sprung to her eyes: "Thank you for telling us about the laurel. Mother will appreciate it so much." Later in the series, Gay spends a summer at the “Lindsey cabin” in Lloydsboro Valley, where she first lays eyes on Dr. Alex Shelby through the hanging of the mirror. The two eventually marry in “Mary Ware in Texas ” and make their home in the cabin where Dr. Shelby stole his first glimpse of the slender girl with her auburn tresses glinting bronze gold in the morning sun. Gay also introduces the Little Colonel to her second serious suitor, Leland Harcourt, in “The Little Colonel’s Knight Comes Riding.” However, despite Gay’s designs and Leland’s glib tongue, he doesn’t measure up to the Little Colonel’s silver yardstick and fails to win the fair lady’s hand. Leal (1876-1954) was one of three children born to James A. McAfee and Stella Joyes. 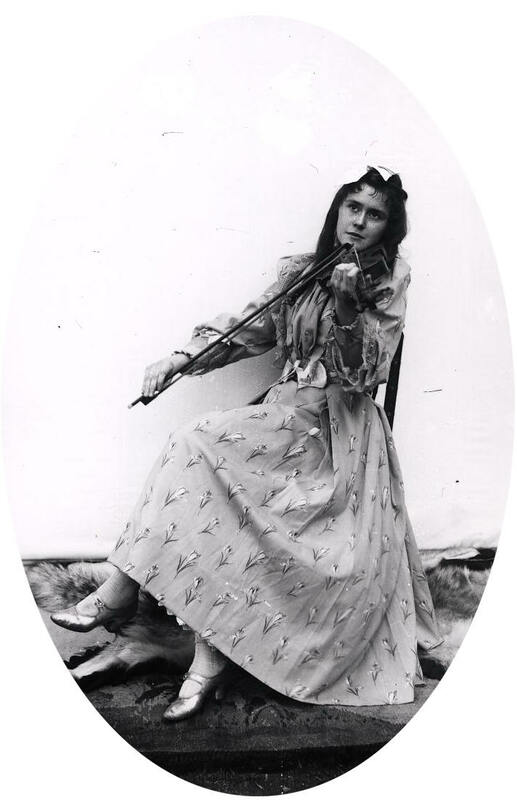 Her older sister, Annie B. McAfee, was born in 1873 and died September 6, 1956. Their maternal grandfather was John Joyes, a Louisville attorney who served in the state legislature in 1827; as the second Mayor of Louisville from 1834-1836; and as City Judge from 1935-1854. 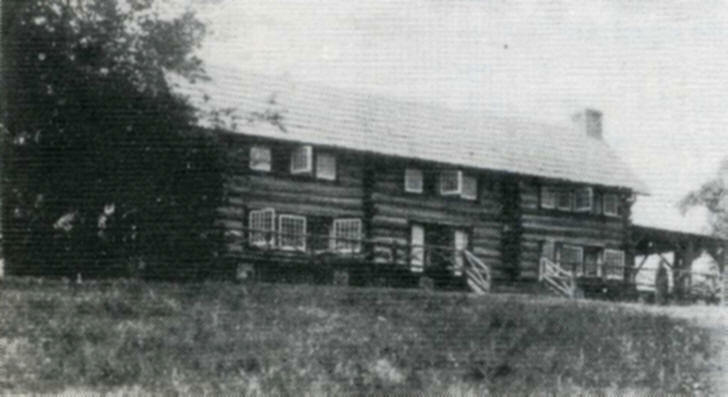 According to both the 1900 and 1920 U.S. Census, the McAfee family lived on what is now Old Forest Road in Pewee Valley in the elaborate two-story (and probably two-family) log cabin pictured below. Mr. Robert Lee Dulaney, whose fatal illness was reported in yesterday’s “Courier-Journal,” died yesterday morning at the home of his father-in-law, Mr. J. A. McAfee of Pewee Valley. Mr. Dulaney’s illness was of short duration, and his death will be a shock to his many friends. 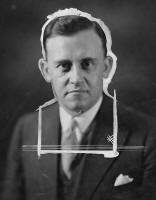 He was the son of Mr. W. H. Dulaney, President of the World’s Fair Commission, and had been married a little less than a year. He was only twenty-eight years old. His illness was not thought to be at all serious until Thursday, when he became much worse, and his father, who was in Chicago, was telegraphed for. Dr. Vance and other physicians of this city were sent for and performed an operation on the sick man. It was to no avail, however, and toward the early morning he breathed his last. Not quite a year ago Mr. Dulaney married Miss Annie McAfee, daughter of J. A. McAfee. While the life of her husband was ebbing away, a son was born to Mrs. Dulaney. The dead man was one of the most popular young men of this city and before his marriage went a great deal in society. Mr. Dulaney leaves behind two brothers, Hector and Benjamin Dulaney, both prosperous businessmen of this city. Three sisters, Mrs. Albert K. Willis, Miss May Dulaney, and Mrs. Joseph Clements, wife of the Interstate Railroad Commissioner of Georgia, survive him. Robert and Annie McAfee Dulaney’s only child, Woodford H. Dulaney, grew up in Pewee Valley with his mother and Aunt Leal and attended the Villa Ridge School. The picture below, taken by Kate Matthews, shows Annie with her son. After graduating from Yale University, Woodford became a banker at Fidelity & Columbia Trust. 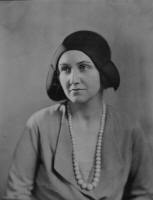 Though just 20 years old when her husband died, Annie never appears to have remarried. The 1900 U.S. census lists her as living with her parents, sister and son in the log cabin. By the 1920 census, both parents are deceased, but Leal, Annie and Woodford are still listed in the McAfee home. Are there any parallels between the real-life Leal McAfee and the fictional Gay Melville? Both lived in log cabins located off Ashwood Avenue near Stumpton, but Leal was a permanent resident from a pioneer Kentucky family, while Gay is portrayed as the daughter of an Army officer stationed in Arizona and the cabin she lived in was rented. The log cabin where the McAfee family lived is still standing, while Gay’s log cabin burned down before 1911, according to Annie Fellows Johnston’s autobiography. Another point against Leal serving as the real-life model for Gay is her age. In 1905, the year the “Little Colonel’s Christmas Vacation” was published, Leal was 29 – far too old to be a student at Warwick Hall. The oral tradition in Pewee (Lloydsboro) Valley maintains that Leal MacAfee was indeed the inspiration and model for the character of Gay Melville. 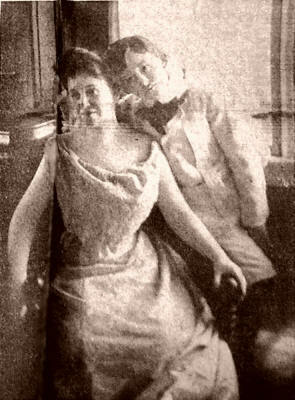 We also must consider the possibility that Leal merely served as Kate Matthews’ model for the Gay Melville photos and that Annie Fellows Johnston based Gay’s character on another girl she may have met through the Lawtons or during the years (1902/03) she spent at Lee’s Ranch in Arizona with her stepson John. Robert Lee Dulaney and Annie McAfee Dulaney are buried at Cave Hill Cemetery in the Dulaney family plot, section P, Lot E. Leal McAfee is also buried at Cave Hill, but in Section 4, Lot 31, Part S1/2, Grave 9, with her parents, James A. McAfee (service 1/7/1899) and Stella Joyes (service 7/5/1900).